AC Compressors - BuyAutoParts.com Has Quality Parts at Great Prices! Is your AC blowing warm air? Select your vehicle below to find a guaranteed exact fit replacement AC compressor from BuyAutoParts to keep you cool this year. Your car's AC compressor is just one part of the entire air conditioning system, but it might be the most important component. Responsible for "compressing" the system refrigerant to increase the temperature, the AC compressor (also called the AC pump) is the classic "use it until you lose it" car part. In other words, when it's working, all is fine with the world. But when it stops working, it's time to panic. And even though the AC compressor doesn't qualify as a safety component, driving in triple-digit heat with no AC pump can be a dangerous act. At the very least, those mid-summer commutes without the benefit of a working, fully functioning car AC compressor can be distracting enough to pull your attention away from the road. 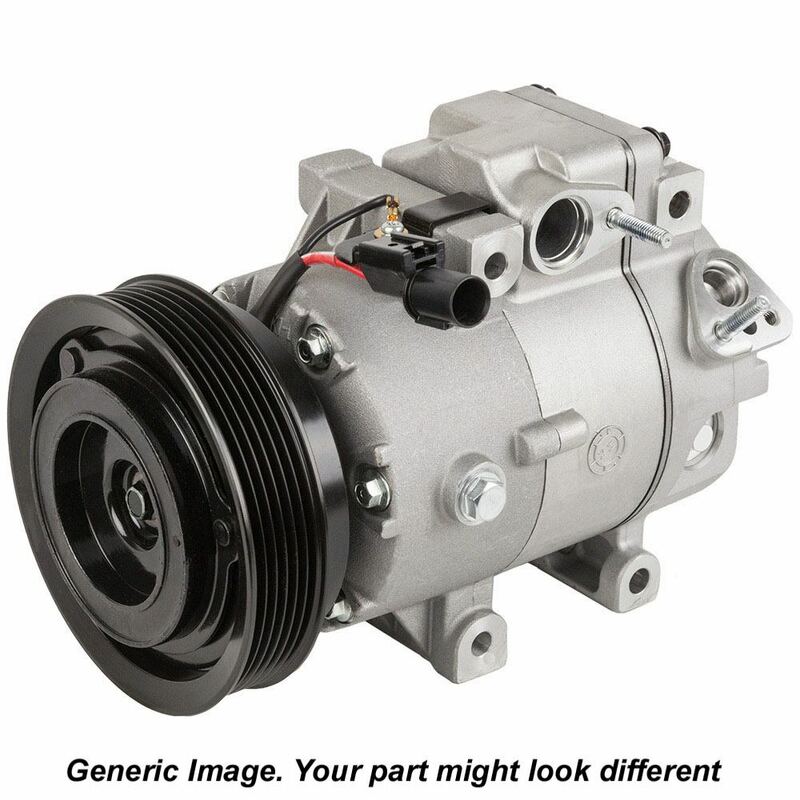 BuyAutoParts.com, your #1 source for AC compressors, proudly offers some of the finest OEM quality AC compressor replacement parts available anywhere. Our dedication to your complete satisfaction shows with exceptional customer service, helpful online tools & resources, and other perks such as our Best Price Guarantee and free shipping specials. The car AC compressor, because of its relation to other system components, is usually regarded as the source of the problem. If you suspect your AC pump or AC compressor might not be working, there are a few simple things you can do to get to the bottom of it. Often times, simple problems are the cause - and that means you can save needless hassle and expense. When you're not getting enough air through your vents, check for vent obstructions. Your cabin air filter (usually located behind the glove box) may be dirty or completely clogged. This air filter isn't as well-known as your engine air filter, but it can still cause sluggish air flow. The last common culprit is the blower motor, which might not be working. Always check your vehicle's fuse box for air flow problems before immediately replacing the AC compressors. Unsure what's ailing your AC system? Do a simple spot check of the entire system - it's easy, cheap and might save you money in the long run. First, turn on your car's AC. With the radio and all other noise-producing accessories off, listen for any strange sounds coming from behind the console panel or inside the engine. Also, take note of how cold the AC air is. But you're not just analyzing temperature; you also need to detect unusual odors as well. A pungent smell may indicate a faulty component or bad fuse, so always check those fuses. Whenever we're running a fever, a thermometer indicates internal body temperature. For your car AC temperature, the AC compressor is a key component to diagnose serious problems. Specifically, we're talking about the compressor clutch. With the AC running, locate the AC compressor, and then find the AC clutch. The clutch resembles a small circular gear, and it helps engage the compressor belt. If the AC compressor clutch is motionless with the AC running, there's a problem with the compressor. You can apply more tension to the belt, or have the AC compressor replaced entirely. Just like your car's brake system, the AC system is "closed." Any refrigerant leaks will negatively impact the AC system. Your temperature may fluctuate, or the system might not work at all. A bad AC compressor can be a source of refrigerant leaks, but not all the time. Sometimes, your AC compressor is to blame. Just like every other car part, it will fail. Some AC compressors are designed, engineered and manufactured to the highest possible quality standards, and will rarely (if ever) need to be replaced. But most AC compressors do fail - it's only a matter of time. How long should you expect your car's AC compressor to last? How Long Will AC Compressors Last? This is one of the toughest questions to answer. Other car accessories come with specific ratings that give you a general idea of how long they should last before failing. Tires, for instance, are mileage rated. If your tires are rated for 75,000 miles, they should last at least that long (although they rarely do, thanks to poor maintenance, bad weather and other factors). Even car fluids like oil have a clearly defined shelf life. Once you've changed your engine oil, a certain mileage afterwards (3,000, 5,000, sometimes 7,500 miles) will tell you when the oil is starting to go bad. AC compressors are different, however. There isn't a specific mileage rating or even performance attributes to rely on. However, knowing a few things about your car, driving habits and other information can give you a pretty good idea whether you should expect your AC compressor to keep on going or fail soon. Let's examine some different factors that determine AC compressor life. Your car's age. If you're driving a 2-year old Toyota, congratulations. You probably won't need an AC compressor soon (or any other car part, for that matter). But if your ride is getting up there in years, your AC compressor may be running on borrowed time. The surrounding climate. Sweltering summertime temps can put a serious strain on your AC system. Some drivers use the AC system sporadically, while others engage the air conditioning during the slightest raise in outside temperature. Not surprisingly, AC compressor replacements are much more common in areas like the U.S. Southwest (Arizona and Nevada) and Deep South (Mississippi, Alabama, Texas, Alabama, Georgia and Florida). Driving and maintenance habits. Everything about your car's performance is interconnected in some way. Let your tires go bad, and brake performance will suffer. Forget to change your oil, and engine lifespan will probably shorten. For dependable AC compressor output, it's a good idea to keep an eye on other fluids, components, hoses, wires and other car parts. Coolant levels. Little or no coolant in the AC system can cause your AC compressor to fail. The tremendous stress and heat eventually add up, so make sure your coolant reservoir and radiator are topped off - it's one of the best things your can do for your AC pump. Radiator condition. If your radiator is failing, the AC compressor won't be far behind. In particular, the radiator's thermostat can also affect the AC compressor. Seized component. Without engine oil, your engine seizes. And without AC compressor oil, the AC compressor stops working altogether. A harsh squealing sound can indicate a seized AC compressor. Leaks. Small defects in the AC compressor body - or also adjacent hoses and fixtures - can cause the AC compressor to fail. It might not happen immediately, but failure will happen! That's why it's always a good idea to check for refrigerant leaks. Compressor clutch issues. We briefly discusses the AC clutch above, but it's worth mentioning just how important it is for AC compressor performance. If the clutch stops working, your car will simply not produce hot air. Regardless of the rest of the compressor's condition, one bad AC clutch can bring the entire part to a screeching halt - and that's exactly the noise you'll hear when the clutch fails. Run it regularly. If you're in a colder climate and don't need to run your air conditioning frequently, it still helps to engage the AC system every now and again. In fact, it only takes about 5-10 minutes per month to give your AC compressor a proper "workout." Neglect and underuse can cause your AC compressor to go bad, so make sure to run your AC compressor at least once every month. If it's super cold outside, you can run your car outdoors - you don't have to be in the car, but make sure the vehicle is in park and the emergency brake is engaged. It's a good idea to stay on the premise when running a car with no occupants. Change the AC compressor belt. Remember the tension issue we talked about before? You can preempt the problem entirely by regularly replacing the AC compressor belt. This not only provides a superior fit around the AC clutch, but it also avoids the potentially devastating situation of a broken belt while driving. This not only causes your AC to stop working, but belt fragments and other debris can damage other engine components. When you find a defective AC compressor in your vehicle, you may have to replace it. Replacing AC compressors are one of the most common repairs in a vehicle, as compressors undergo a lot of stress and can therefore, fail from time to time. From regular cars to high-end SUVs, every vehicle now has an air-conditioning system. The AC compressor is the first component which starts the AC cycle and therefore, a fault in it will put a dent in the performance of the AC system. In addition, a malfunctioning compressor can unnecessarily waste the power generated by the engine. Whether it is your sleek Ferrari or your stylish BMW, when its AC compressor starts acting up, it will result in inadequate cooling of the passenger compartment. The AC compressor can fail internally or due to external parts such as the clutch and pulley. A proper troubleshooting routine can help pinpoint the actual defect with the compressor. The clutch engages and disengages the compressor, whenever required. If the troubleshooting indicates a defect in the AC clutch, it may have to be replaced. At BuyAutoParts.com, you will find replacement clutches compatible with your vehicle at affordable prices. The cost to replace the clutch is lower than replacing the AC compressor. If the diagnostic process implies that the AC compressor has failed internally, you will have to replace the entire compressor. You may balk at the fact that AC Compressors can be pretty expensive and blow a hole in your budget. Relax! We are here to put your anxieties to rest, since we sell AC compressors at affordable prices. If you are experienced at replacing AC compressors, you can go ahead and replace it yourself. With no labor cost involved, you only need pay for the replacement part. Since the cost of the part is at one of the lowest prices here, you can fix the issue with the compressor at a much lesser cost than usual. When you have decided to buy AC Compressors from BuyAutoParts.com, you can buy them with no regrets. Whether it is for their quality, reliability or compatibility, our AC compressors have received positive reviews from our customers. Before replacing AC Compressors, it is advisable to flush the AC system. As most AC compressors fail due to debris or metallic impurities, flushing the system will remove any such deposits in all parts of the AC system. While replacing the AC compressor is important, making sure that any future failure is avoided should also take equal priority. This can save you money in the long run. AC Compressor Best Sellers! Use Shop By Vehicle Above To Find Yours! We're ready to help you find the right AC compressor today. Browse our selection based on your vehicle's year, make and model. If you're having trouble locating AC compressors, our customer service team is ready to help. Just call us at (888) 907-7225. Thanks for visiting the BuyAutoParts.com AC compressor store! Find out how automotive AC works with this handy infographic that explains the full process. Understanding how the AC system works is the first step to knowing what might be wrong with your AC. Our buyer's guide helps you through any difficulty you might have when shopping for your AC Compressor online. If you have any doubts about purchasing your AC Compressor online with BuyAutoParts.com, read this guide. Looking to complete the AC Compressor replacement on your own? This is the guide for you! How do I keep my AC Cold? This infographic tackles the age-old question of how to keep your automotive AC cold? There are reasons for everything that might be going on, we help you figure out why they are going wrong. Need to know how much oil belongs in your car's AC system? This guide will give you the answer you need.